Lake Eola Park, is a nature wonderland right in the middle of downtown Orlando. 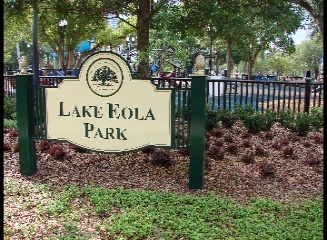 Lake Eola is in the center of this 43 acre park, surrounded by a .9 mile sidewalk perfect for bikes, and strollers and walkers to get in some exercise while taking in all the sights. This park is good for a whole day's adventure, as there are plenty of fabulous lunch deli's surrounding the park to discover, and also giant swan pedal boats to rent to paddle around the lake(Swan Boat Information: (407) 232-0111 ). I like to go there in the spring when you can see the baby ducklings and baby swans. On this day we saw a black swan sitting on her nest full of eggs, waiting for them to hatch. Bring a loaf of bread or a bag of cracked corn to feed all the friendly swans, geese, ducks, herons, and more! We were lucky to be there on the day the caretaker feeds the birds. He feeds them twice per week. He let Bryan give the birds some cracked corn, and bird food mixture, and Bryan really enjoyed it! The highlight of this park is the fabulous newly renovated children's playground on the Northeast corner of the park. It has a brand new, futuristic look and feel, plenty of shaded areas with picnic tables, and the whole park base is covered in a spongy soft covering to prevent injuries. So spend the day, and enjoy all that there is to see at Lake Eola Park! One of Florida's Finest!